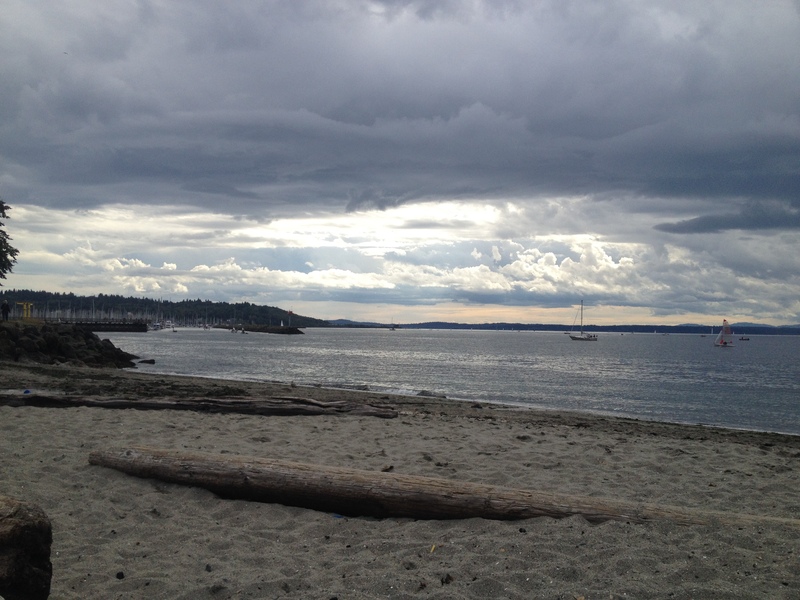 Really, it doesn’t always rain in Seattle as you can hopefully tell from the images on this blog. I’ve lived here seven years now, but I’ll probably always identify as a Southern Californian and I seem to forget everything I know about rain if it’s been clear for a couple days. I figure it’s a survival mechanism. Anyhow, yesterday started out clear with a forecast of 70 degrees and some clouds here and there. Perfect last beach day of the year. I packed up Shade Shack, picnic blanket, swim suits, beach toys, extra clothes, and snacks. The kids opted to ride their own bikes, which is happening more and more these days, but I went light on toys in case I had to tote them both at the same time. 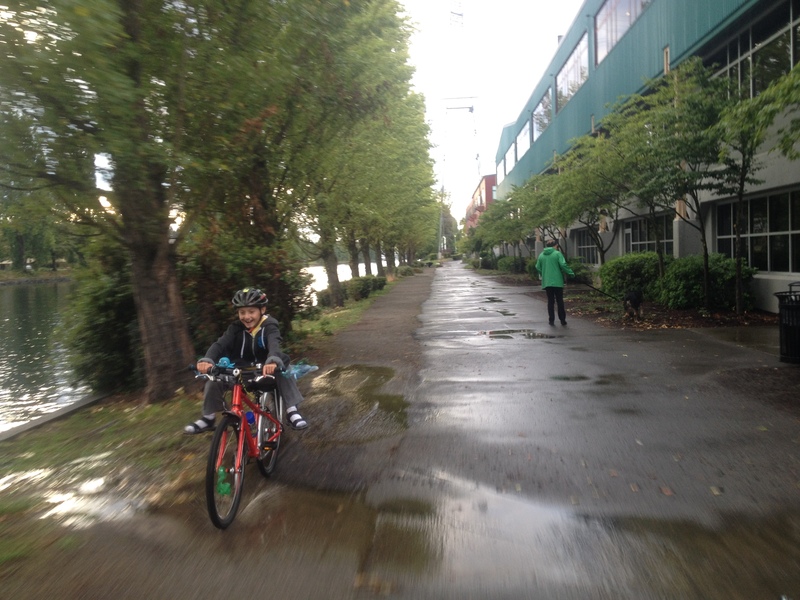 I ended up only having to tote the six-year old after he jumped off a Google step too high (as I was saying, “Hey, that’s too high to ride down!” of course) and banged his shin on his pedal. 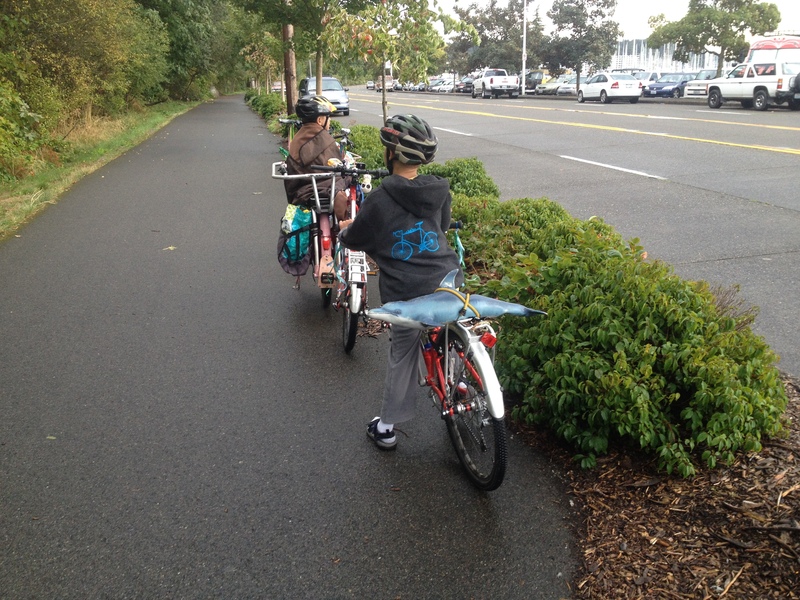 I love when they ride their own bikes, but it’s also nice getting to carry one of them because we move more quickly and I only have one trailing kid to worry about staying out of trouble. The beach was a little cool and cloudy. 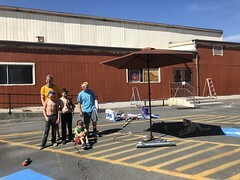 I didn’t pop up my Shade Shack and soon needed to put on my sweatshirt…and that’s when I realized I’d forgotten the kids’ sweatshirts at home. But they were fine playing in swimsuits, as were all the other kids at the beach. The clouds got thicker and thicker, we heard thunder rumble in the distance, and the multitude of boats out in the sound quickly made their way back into the marina. Fortunately, I thought to check my favoritest app: Dark Sky. I don’t have a ton of apps on my old iPhone and rarely shell out for non-free ones, but Dark Sky is worth the $3.99. I saw we’d have light rain in three minutes, lasting for 25 minutes, so we walked over to a sheltered area for snack. Dark Sky doesn’t always get it right and the light rain was more of a heavy rain and the wind blew it into our overhang so we darted for the ladies restroom and the kids changed back into regular clothing as we waited out the accurate 25 minutes. 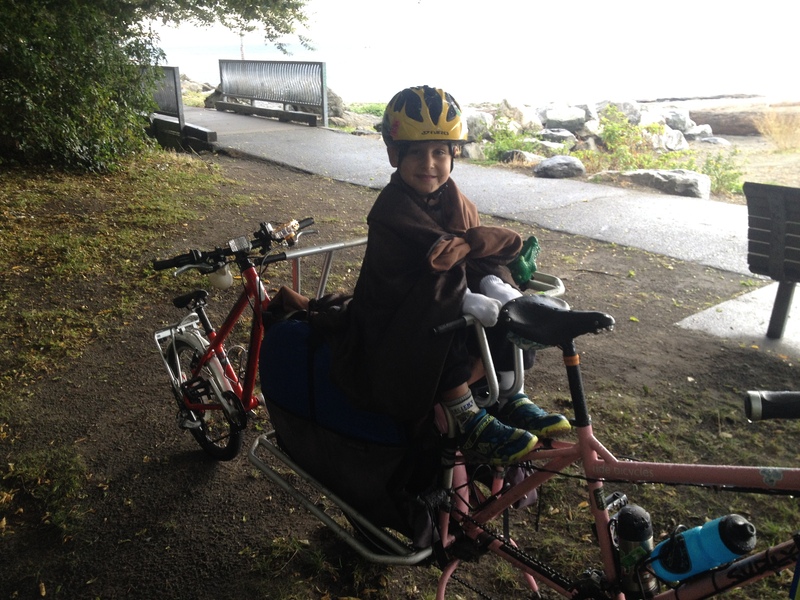 My six-year old was content to keep riding on my bike so I wrapped him in our picnic blanket, rubber band holding it closed in front of him. He stuck his hands into his spare socks for make-shift mittens. I sacrificed my sweatshirt to my eight-year old a few blocks from the beach when he said he was cold, but I was OK in just tank top, shorts, and flip flops. Having a heavy bike really helps at times like this, although I would have been cold if it was all downhill. We stuck to our original plan of dinner at Red Mill Totem House, getting hit by a bit of drizzle on the way there. I had expected it to be empty, but it was full of people taking refuge from the storm…including a family of four on bikes–one parent with a rear kid seat and the other with a trailer bike–figuring out how to get home to Capitol Hill. I heard them wondering about getting the trailer bike on the bus. I told them they’d probably be able to carry it on, though it was at the discretion of the bus driver and volunteered to carry it home to Wallingford on my cargo bike if they found themselves in a bind. I assured them I love carrying things for people, but they ended up getting on with no problem. I was very impressed by them. It’s one thing for everyday riders to get stuck out in the rain five miles from home, but this family had “done this ride before” so it wasn’t a regular thing. 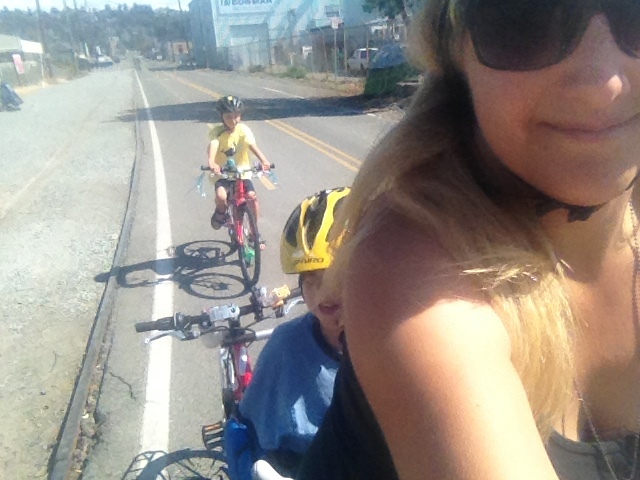 Not to mention what a hassle it can be to put both bikes and little kids on a bus! I hope they had fun getting home. I was quick to declare, “What an adventure!” to my kids as the drizzle hit and fortunately they agreed. Dolphie the dolphin rode on the rear rack of my eight-year old’s rack and his chauffeur declared, “Dolphie hopes it starts raining!” but fortunately we didn’t encounter any drizzle for the 45-minute ride home. Lots and lots of puddles, though. Thank goodness for fenders! I got caught out last Tuesday on the way to and from my daughter’s doctor’s appointment. Thankfully she just slept right through it. Sounds like your kids are troopers too!